discussed "Memories of Early Grants & Surrounding Area"
Following the regular meeting agenda of progress reports by the past-term officers to the membership on hand, an election was held for new officers. Two positions were filled with new candidates being voted in for two-year terms: Josephine Hurtado as the Vice President, and Karen Cerniway as Secretary. All other positions were re-elected, led by President Randy Hoffman. From that point, Mr. Joe Diaz, a prominent Rio Grande Valley attorney, spoke at length on his childhood in the Grants-Milan-San Rafael region of Cibola County. Considering his previous CCHS session a year earlier, most of his anecdotes were hilarious - and involved names that were very familiar to most of the CCHS members and other guests present. Mr. Diaz has an excellent memory and as an attorney he has great public speaking skills. 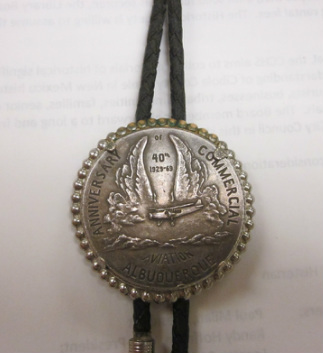 Overall, this quarterly meeting of CCHS was an event that was greatly enjoyed by everyone in the gallery. 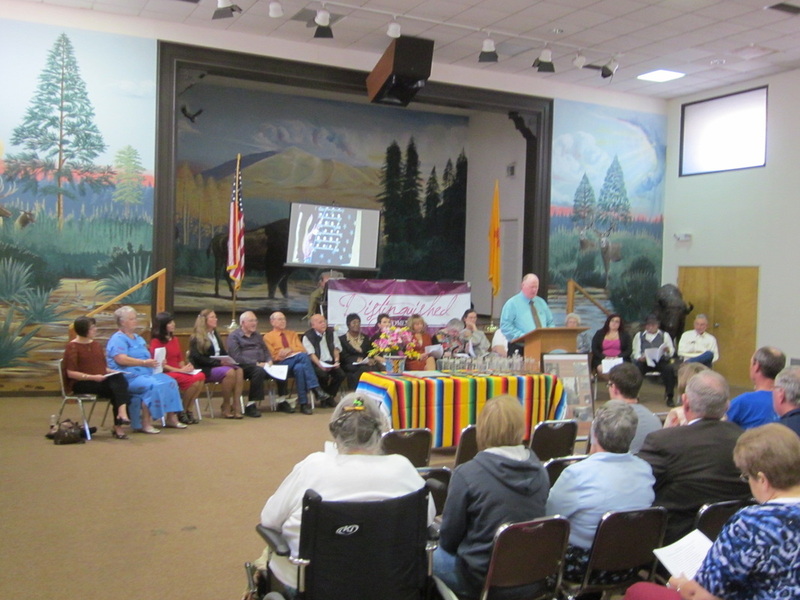 "New Mexico's Spanish Livestock Heritage: Four Centuries of Animals, Land, and People"
Bill Dunmire, of Placitas NM, was the guest speaker for the June 8th quarterly meeting of CCHS. Bill served 28 years in the National Park Service as a naturalist in several parks including Yosemite, Hawaii Volcanoes, Yellowstone, and Carlsbad Caverns. He is the author of a number of natural history books. New Mexico's Spanish Livestock Heritage (2013, UNM Press) is his latest - the first history ever published on the subject. Dunmire presented an absorbing slideshow to the CCHS audience of nearly twenty. He discussed the evolution of domestic livestock in the several cultures of what became New Mexico, beginning with pre-Spanish Native peoples of the region. He explained that the wild animal species of the plains, deserts and mountains - bison, elk, deer - could not be pursued, captured or least of all domesticated by agrarian Native peoples, Chacoan or Puebloan, with no knowledge of the horse. The Spanish exploration and colonization of their northern frontier, however, brought new animals into the native lands from Mexico. Most startling to the Indian peoples initially was the horse, carrying armored soldiers. Needless to say, some tribes soon began to acquire horses once they understood their value. Spain's colonization brought horses, goats and sheep to the new Rio Grande settlements, as well as mules, burros and oxen. These beasts of burden supported trade with Mexico, and allowed animals to do the work formerly done by humans. Later, large herds of cattle were introduced onto the plains of New Mexico, where ranchers prospered by raising beef on the grasses of huge land grants. Dunmire explained the benefits to the four cultures of New Mexico which domesticated livestock over four centuries - Spanish, Puebloan, Navajo, and Anglo. He also described, and illustrated, some of the significant changes that livestock caused over the years, such as the effects of overgrazing on the lands. Program: "The Civil War in Western New Mexico - a Confederate Presence in Cubero"
Mr. Cochran made his presentation in a replica Confederate uniform appropriate to that of General Henry Sibley’s Texas Mounted Volunteer troops who advanced north from El Paso into New Mexico along the Rio Grande valley in early 1862. 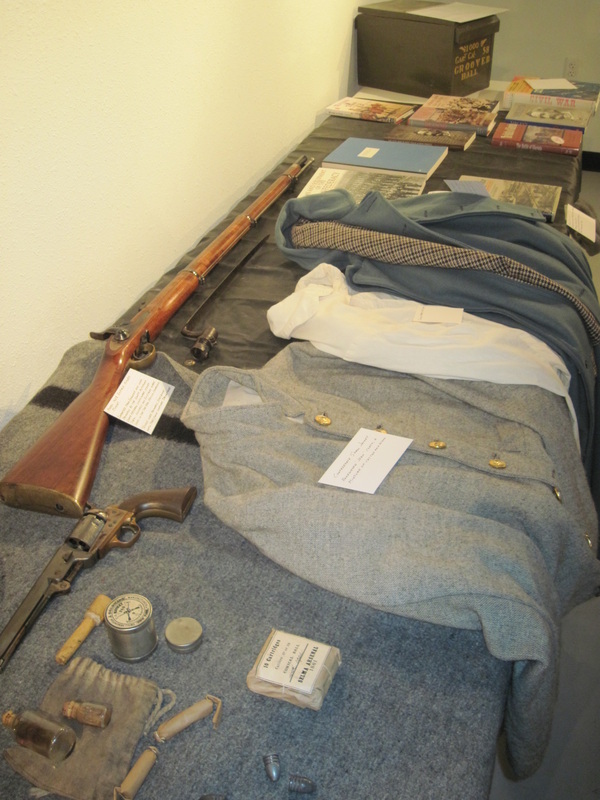 He also displayed a “Stars and Bars” flag along with his extensive collection of Civil War books, uniforms, soldiers' equipment, and weapons. The talk covered the South’s New Mexico campaign, from its key early battles to the crucial defeat of Sibley’s force at Glorieta in March 1862. 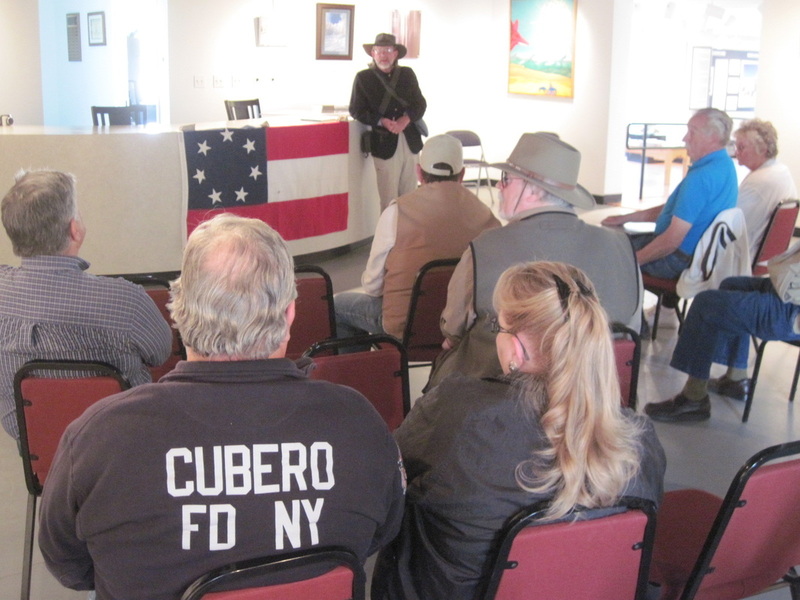 The main focus, however, was to remember and honor three young Confederate soldiers who had died from illness at Cubero during Sibley’s slow, arduous retreat to Texas. On March 3rd, Capt. Aragon of the New Mexico Militia at Cubero had surrendered the post, stores and militiamen to the Confederates. 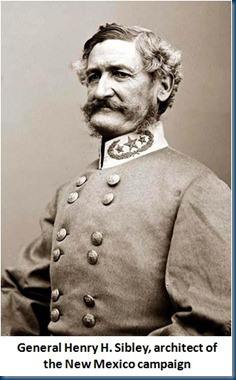 Then, after the Glorieta defeat on March 28, the remainder of Sibley's force retreated southwest. Three badly ill Texans were left behind at Cubero for care, but eventually died, and they were buried at the village cemetery. Their graves were nearly erased by time, but for one headstone which attracted local interest and research. Recently, local Confederate re-enactors provided a new fenced grave marker for these men, and a flagpole. The three Texan soldiers are honored here, so far from their homes, each Memorial Day. This presentation was dedicated to Betty DeSoto of Cubero, and also in memory of CCHS member Brenda McBride. The first general meeting of the new year, held at the Double Six Gallery in Grants, showcased a new book being prepared by CCHS Historian Paul Milan and Cibola Beacon Editor Donald Jaramillo. As seen in the 'Cibola Stories' section of our website, Historian Milan has been writing local reminiscences for more than a year now, which are published regularly in the Cibola Beacon. 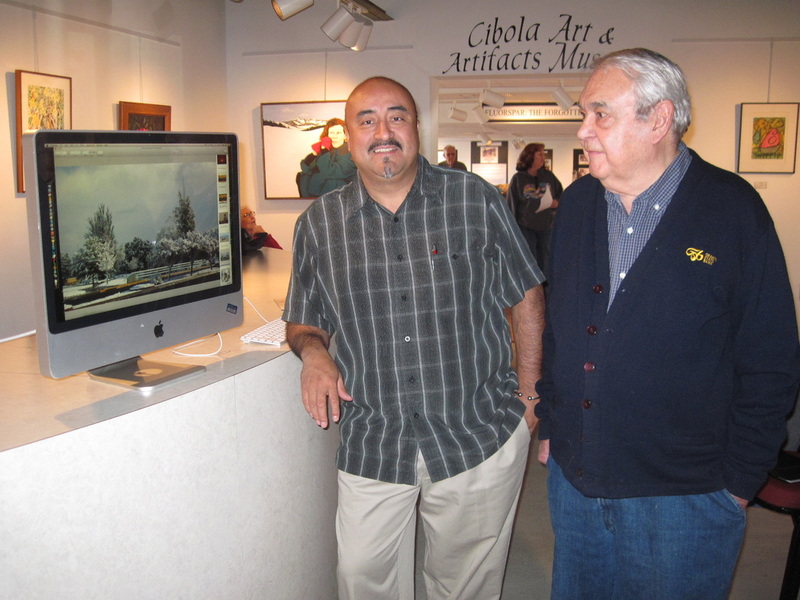 The collaboration of these two community figures has over the past few months sought out historic family and news photographs from the earliest days of Cibola County. The result has been a large quantity of photos that show the people, places, and events over the years in Grants, Milan, the county's Native American pueblos and towns, and the other small communities and rural areas that make this area unique. As the publishing deadline approaches in early spring, Paul Milan opened the book development presentation by stating that it is now "Last Call" for further photographs to be submitted for consideration in the new Arcadia Press book, "Images of America: Grants-Milan." From this point, an absorbing slide presentation held the attention of the 25 members and guests on hand. Many of the pictures showed pioneer families, school classes, and local notables from many generations. Others showed the evolution of the industries, businesses, and communities across the region that have seen constant development and change for much more than a century. 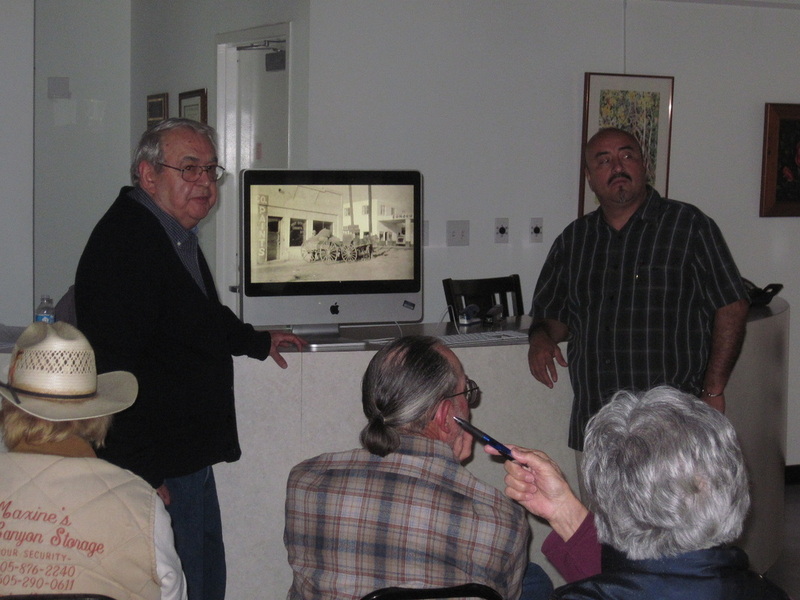 Many of the long-time locals in the audience were able to identify people and places and events that will aid the authors greatly in completing the captions and text of the new book, for publication in early 2013. Donald Jaramillo and Paul Milan preparing the Images of America slideshow for the CCHS presentation. 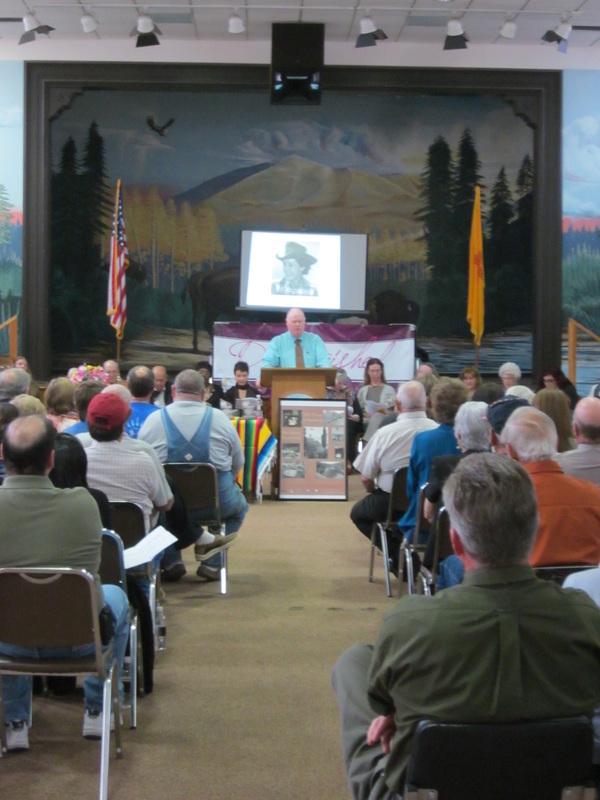 The year's third CCHS Quarterly Meeting for the members and the public was devoted to the 1912-2012 New Mexico Statehood Centennial. After extensive publicity for a write-in campaign across the region, 19 nominees from the spectrum of Cibola eras and locales were honored for their accomplishments during the New Mexico Century of Statehood, as listed below. 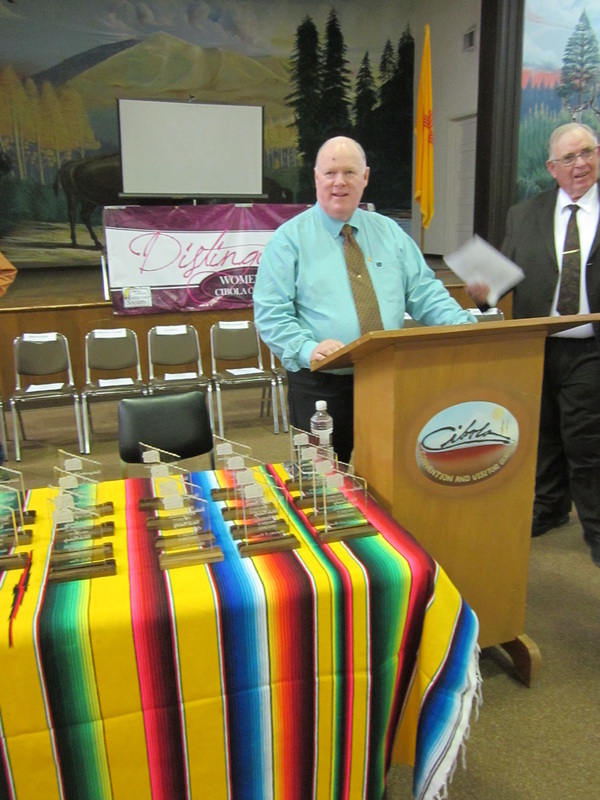 Awards to each Distinguished Woman of Cibola County included a book summarizing all of the honorees' biographies and contributions to New Mexico and the Cibola County region, an engraved individual plaque, and a listing on a special CCHS plaque of all honorees, to be displayed in the Cibola County Office Complex. The Award Ceremony on Sept. 15th was attended by more than 100 society members, honorees, and family members - the largest audience in CCHS history! 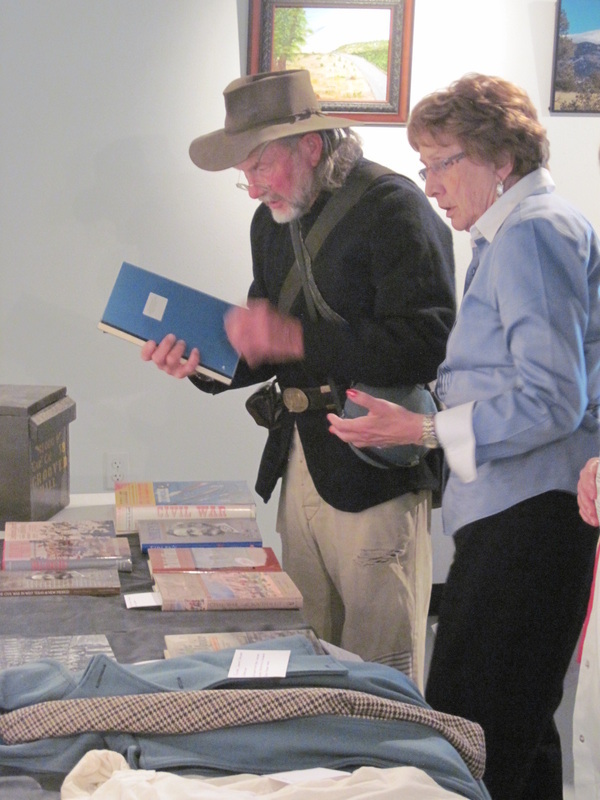 A special highlight of the event was a virtuoso performance by noted historic reenactor Van Ann Moore, who also had brought New Mexico history to life for CCHS members with her performance at the Double Six Art Gallery in March. She impressed the audience of this event with her homage to Dona Tules Barcelo, the notorious and quite wealthy Santa Fe businesswoman who helped arrange for the 1846 graceful exit of Mexico's Governor Manuel Armijo and the arrival of General Stephen Watts Kearny, whose Army of the West thus made Santa Fe a city of the United States. The bloodless takeover of "old" New Mexico by Kearny's force is credited to the diplomacy of Dona Tules. *Ms Barcelo/Moore thus became the 19th honoree of this statehood event. Further nominations are needed during 2013. Other 'Distinguished Women' will be added to the list of honorees by CCHS, continuing this Centennial project into future years. CCHS President Randy Hoffman conducts the "Distinguished Women of Cibola County" awards ceremony. The second CCHS Quarterly Meeting of 2012, held in Milan at 3:00 PM on June 9th at the Village Parks & Recreation building, attracted a crowd of some 50 CCHS members and the public. This session focused on Aviation History above Western New Mexico over eight decades. The Guest Speaker was Harry Davidson of Albuquerque, historian/curator of the New Mexico 'Cavalcade of Wings,' a group dedicated to modeling all the aircraft that have passed over and through New Mexico. Their displays at the Albuquerque Sunport terminals are a significant history resource, both for airline travelers and for all New Mexicans. Mr. Davidson's lecture captivated the audience, who responded with applause, and with many questions afterward, as he discussed the roots of early aviation, the Lindbergh role in New Mexico, and the notable crashes along this airway corridor. He also displayed pilots' uniforms of different eras, and medallions honoring development of aviation across New Mexico. **This presentation followed the Phase One dedication in Milan of CCHS's developing Western New Mexico Aviation Heritage Museum, at the Grants-Milan Municipal Airport. This dedication event was held at 1:30 PM on June 9th.